Cotton Clouds has Bundles of Baby Blankets! Babies & blankets go together like chicken and eggs! Blankets are wonderfully practical items to give as gifts and CottonClouds.com has a great variety of knitting, weaving and crochet kits from which to choose! They say that babies love to be swaddled, so tucking in a little one with a handmade blanket is like giving them a little extra hug! So Soft for Baby’s Delicate Skin! Left to right: Modern Cotton Baby Blanket Kit, Knit Blankets book, and Organic Cotton Baby Soft Blanket Kit! Cotton is soft on a baby’s delicate skin! Moms love the oh-so-easy care that comes with cotton fabric, no matter if it is knit, crochet or woven! Looking for a few great ideas? Check out the Modern Cotton Baby Blanket Kit, Knit Blankets book, and Organic Cotton Baby Soft Blanket Kit! Warm in winter, Cool in Summer! With their internal temperature regulation still developing, a cotton or cellulose-based yarn like bamboo blanket will help keep the wee one warm in winter and cool in the summer. Our Bambu baby blanket kit includes Bambu, grown without pesticides or fertilizers, making this an ideal all-natural gift. Don’t you just love these two-tone color choices! Blankets Come In All Sizes! Blankets are fabulous projects to make because you don’t have to worry about the fit; any size is useful! Having a fun colorful blanket also makes a great space for the baby to play with their toys and observe the world around them. The kits shown above come with everything you need to make a gift that is sure to be cherished! Clockwise from top right: Panda Silk Waffle Weave Baby Blanket, Sprout Baby Blanket, Sweet Honeycomb Waffle Weave Baby Blanket, and Pakucho Organic Cotton Baby Blanket. Help Children Around the World! With our newest kit, the Friendship Baby Blanket, you can help others help their children as well! The Friendship Baby Blanket is part of a larger project: The Natural Dye Project that allows the women to earn a living wage. When your favorite baby is snuggled in one of these blankets (each kit makes two! ), hand-dyed and handwoven with love, know that a child in San Rafael, Guatemala will have a richer life! Children grow and thrive when they are surrounded by love! What projects have you made that are your favorites to make for babies? 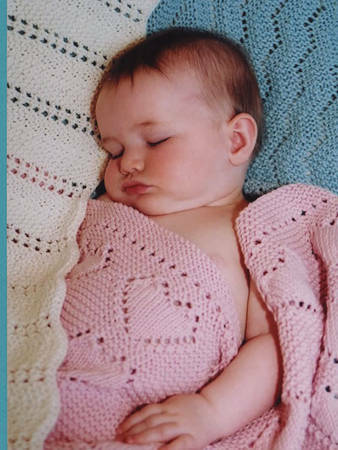 Does your child have a favorite blanket or snuggle buddy? We invite you to share them with us by posting to our Facebook page or our Ravelry group, tag us on Instagram when you snap a quick picture, and join us in the Cotton Clouds Kit-of-the-Month Facebook group! Inspire someone today to make a wonderful baby gift! Here’s to many snuggles and cuddles with a cozy blanket!